This soup has always been a favorite of mine and I usually try to order it when it’s offered on a menu. 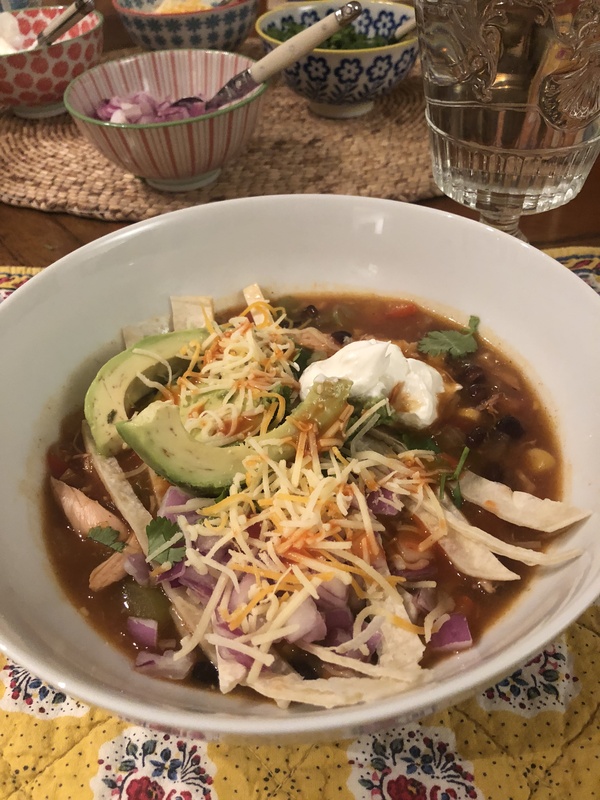 I am a big fan of Mexican Food and have always wanted to try to make my own Chicken Tortilla Soup .This is a super easy version using a store-bought rotisserie chicken and a packet of Taco Seasoning. Now that the weather has turned super cold it’s a perfect time for heart warming meals. I started cooking soup in the afternoon, prep was pretty quick and I let it simmer for an hour and then turned off stove while we went out. When we got home I turned on the stove and continued cooking soup. I cut up avocado, chopped up some cilantro, put sour cream and cheese into some little bowls and in less than 1/2 hour we were sitting eating this delicious and tasty soup! Joel even ate the avocado!!!! This is big!!! He loved the soup. It’s very filling. I use crispy tortillas if that’s what I have in the house. It is delicious with soft corn tortillas sliced up and added into the soup at the end also. I love when the crunchy chips go soft in the soup with the melted cheese– I could go on and on about this soup. Tonite I used soft tortillas. 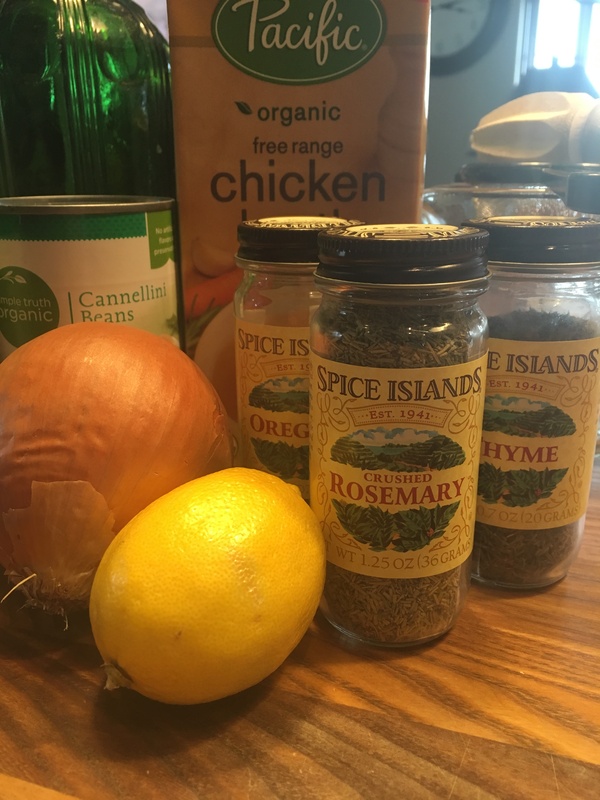 If you have the time I suggest making this soup, it is so easy with a prepared chicken or you can make your own chicken . 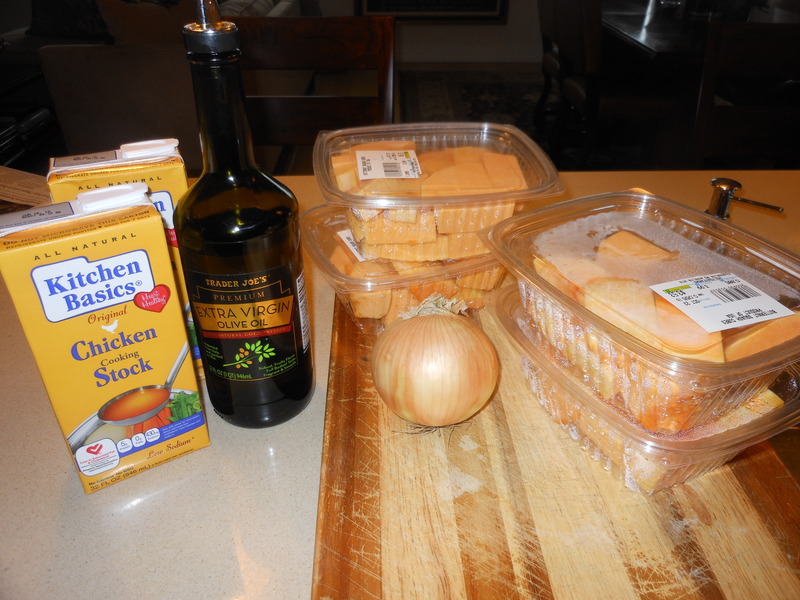 The prep is about 15 minutes using store-bought chicken and cooking is about 1 1/2 to 2 hours for soup. I just think soup tastes better the longer it sits. I prefer making it in the early part of the day and letting it sit on the stove for a while. This is a big soup and will probably serve 6-8 nicely. I have a container in my freezer and 4 of us ate this soup. Look for my slow cooker version also on my blog. 5 Soft Corn Tortillas (I use the small ones) cut into uniform strips or crunchy tortilla chips–use as many or as little as you like–or skip all together for a lighter version. 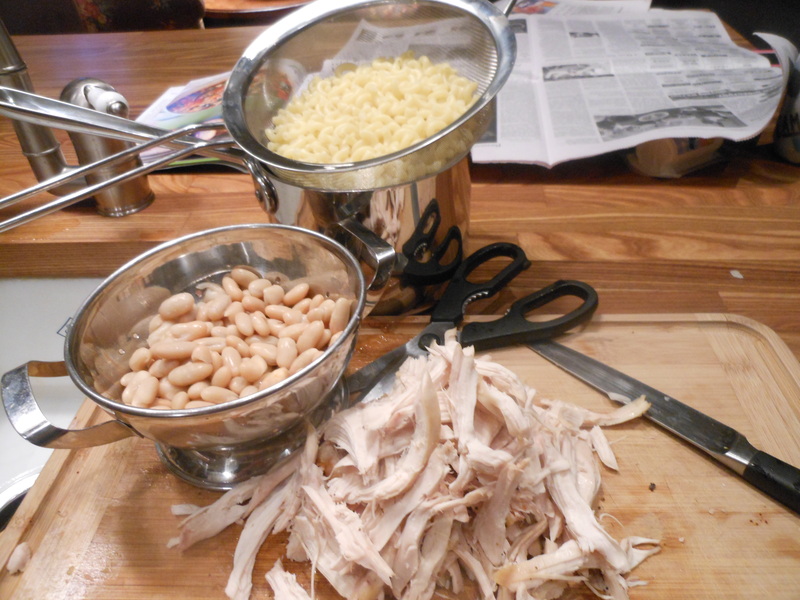 I took skin off chicken and shredded most of the chicken meat. Heat 1 Tbsp. Olive Oil in a large Pot –dutch oven is great here (Le Creuset) add onions, peppers, and minced garlic. Stir and begin cooking, then add the packet of Taco Seasonings if it’s very dry and hard to stir you can add a little more olive oil. Add in the shredded chicken and stir it all up. Pour in Rotel, chicken stock, tomato paste, enchilada sauce, water , black beans and corn. Bring to a boil, then reduce heat to a simmer. Simmer for app. 45 minutes to an hour, uncovered. In a little bowl mix 3 cornmeal with a small amount of water , just enough to mix it into a paste like consistency. Pour into the soup, then simmer for an additional 30 minutes at least, I cooked for another hour. I always believe the soup is best when it sits for a long time. Check seasonings, adding more salt if you need it , I added kosher salt because I felt it needed it. Taste has to be your guide but be sure not to undersalt, you don’t want this to be bland. Turn off heat and allow to sit for about 20 minutes. Five minutes before serving, gently stir in the tortilla strips if you’re using them. Ladle into bowls, then top with your favorite toppings and there you go! I think the chips/tortillas make this soup along with the cilantro and avocado. Let your taste be your guide here. Soup Season is officially upon us even though today is a particularly warm day in New York. It’s still the time of year that you like to hunker down with a cozy delicious meal. This was an absolutely delicious dinner soup I made the other night. 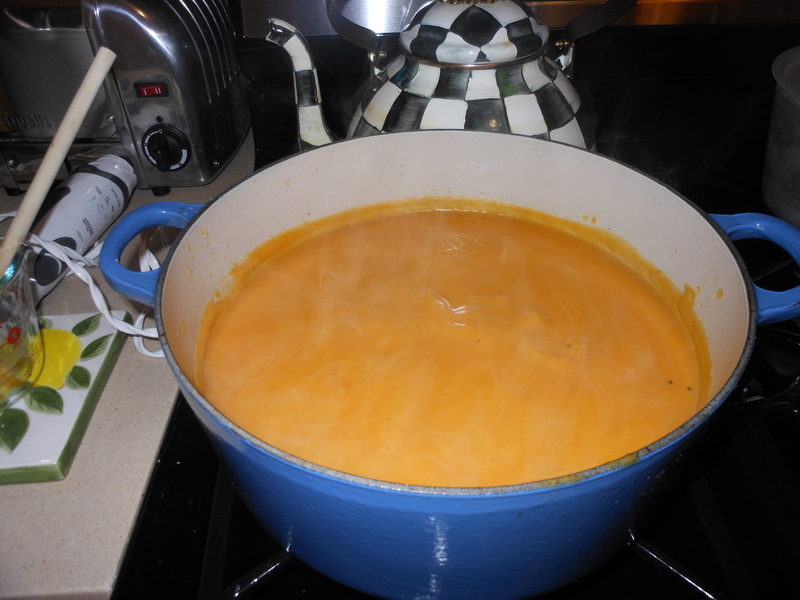 I like my soups to simmer for a while on the stove top, I made this soup about 2 hours before we were going to eat it. This soup can be made rather quickly or you can allow it to simmer for a few hours. It’s even better the next day. If serving the next day you will most likely need to add liquid, I added a little bit of water or you can add stock. Just add a little at a time. 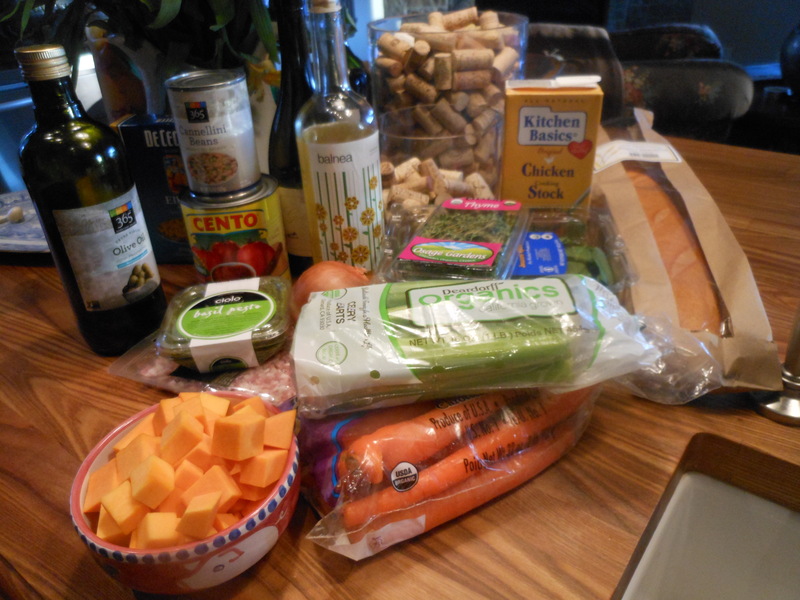 There is a little effort involved here but mostly chopping and prepping. I used my mini-processor for chopping carrots because I wanted them finely chopped. The fresh herbs tasted wonderful and I wouldn’t omit. You can use turkey or chicken sausage or any kind of sausage you would prefer. I served alongside a crusty bread, manchego cheese and a beautiful red wine. 1 pound spicy turkey sausage, Italian sausage (casings removed) chicken sausage, whatever you prefer, chopped. app. 1/2 lb. baby spinach–or any greens you’d like. You can eyeball it to see how much you’d like to use. You could use heartier greens, like kale or collard greens–just be certain to cook them in the soup for at least 5 minutes prior to serving. You want them to wilt and break down a bit. In a large stockpot heat the olive oil over medium-heat. Cook Sausage, stirring occasionally and breaking up any large pieces as it cooks. Cook until browned, app. 10 minutes or so. Transfer sausage with a slotted spoon to another plate. Add onions, carrots, and garlic to pot and cook in the oil from sausage. Stir frequently, until onions are tender. App. another 10 minutes. Add sage, rosemary, salt , pepper and red pepper flakes. Stir in chicken stock, tomatoes and their juices, and reserved sausage. Bring to a boil, then reduce heat and simmer until flavors have melded together, at least 15 minutes. I let it sit and simmer for about 2 hours on a very low simmer, stirring occasionally. Before you’re ready to serve you will do this next step: this will add 15 minutes more of cooking time, you can always simmer longer. 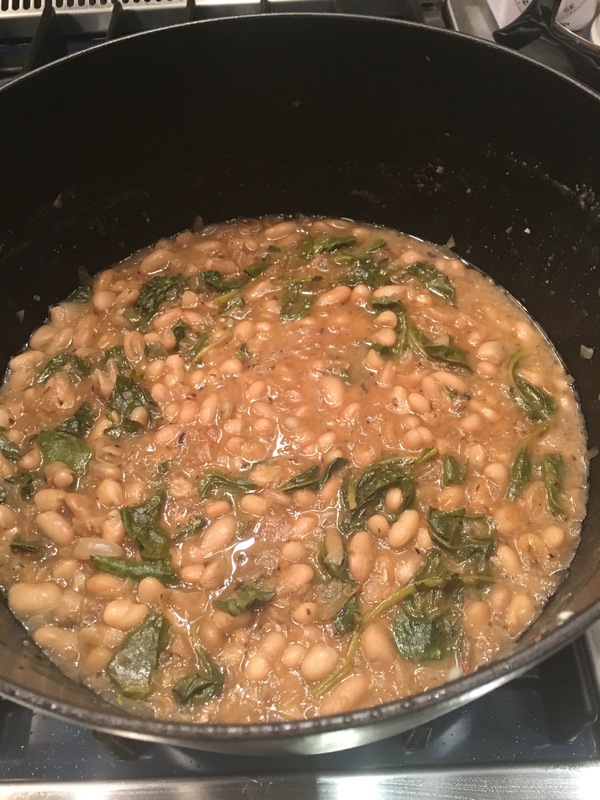 Coarsely mash beans from 1 can of rinsed , drained beans. You can use a fork for this or a potato masher. Then add this mash to soup. Stir in the almond milk and remaining 2 cans of rinsed, drained beans. Let simmer for another 15 minutes at least. Taste for salt and pepper at this point. I didn’t need to add any. I added the spinach a few minutes before serving, just eyeball out about 1/2 cup of baby spinach or whatever greens you are using. The heartier greens like kale will take a little longer to break down. You can top soup with freshly grated parmesan if you’d like. It’s definitely fall and my first soup of the season is almost always butternut squash soup. I’ve simplified the recipe along the way so that now it is just the way Joel and I like it. it’s pretty easy as long as you buy the squash pre – cut (available in every supermarket, and corner produce store). 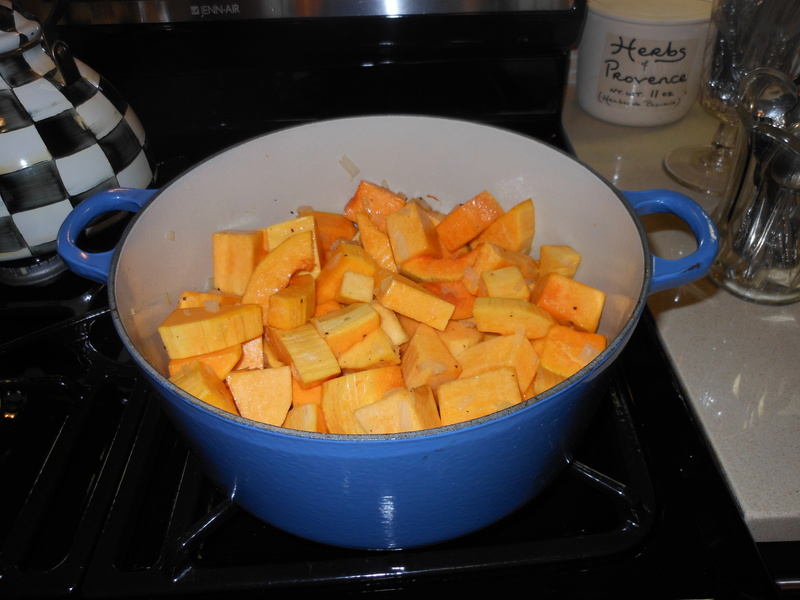 I just made my first batch of the season, and the squash is sweet and delicious. I always add a little butter to it, but you can totally leave it out. It tastes so creamy you’ll swear there’s cream in it, but really, there is none. I love a little freshly grated nutmeg in it too, but you can certainly just sprinkle in a very little bit of grated nutmeg. I hope your family and friends enjoy this as much as my family does! It’s always on my table for Thanksgiving. A delightful way to start a dinner, or a delicious main dish served alongside a beautiful salad and bread. 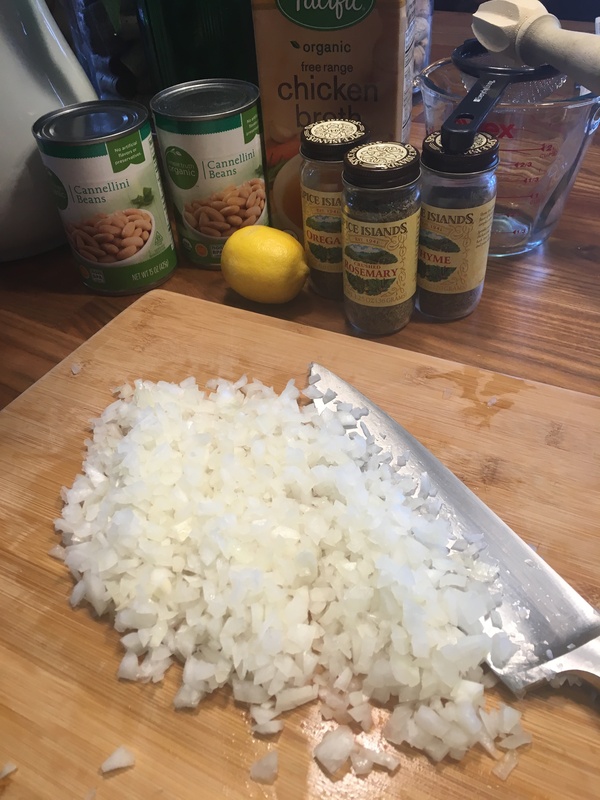 This can easily be made vegetarian by substituting chicken broth for vegetable broth, which is how I make it on Thanksgiving for our daughter Kerri , who is a vegetarian. In a heavy bottomed Le Creuset (or any other ample size large pot), I heat 3 tablespoons of olive oil. When oil is heated, put in onion and about 1/2 tablespoon of kosher salt. Sweat out the onions until they are translucent (approx. 5 – 8 minutes). If you’re using the butter, add it now too. 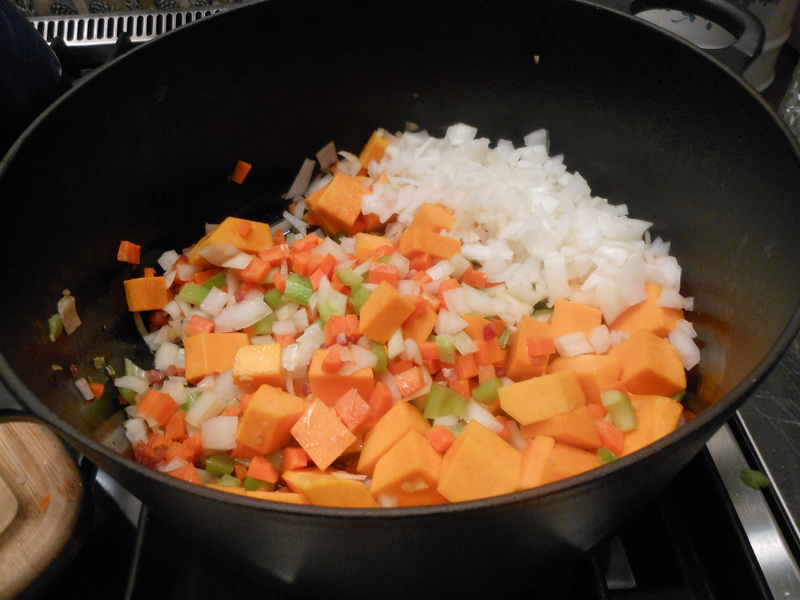 I then add all of the butternut squash and mix the onions, oil and butter as best I can all over the squash. Next, add enough broth to cover the squash (I used approx. 10 cups of chicken broth to cover). I keep the remaining half a box of broth in case I need it later. Return to a low boil, then bring to a simmer. I let it cook a very long time–at least an hour until soft–and then I turn off the heat and let it sit for a while. I like to make it early and let it sit for as long as possible, because the squash gets very soft. Then right before I am about to serve, I use an immersion blender and blend it into a beautiful smooth soup. If you need more broth, add it as you blend. This is also your salt, pepper and nutmeg moment. Season to taste and blend just until smooth. I leave it in the pot until I need it and then gently warm it up. This soup will keep in the fridge for a few days. It can be frozen as well. Upon defrosting you may need to add more broth. 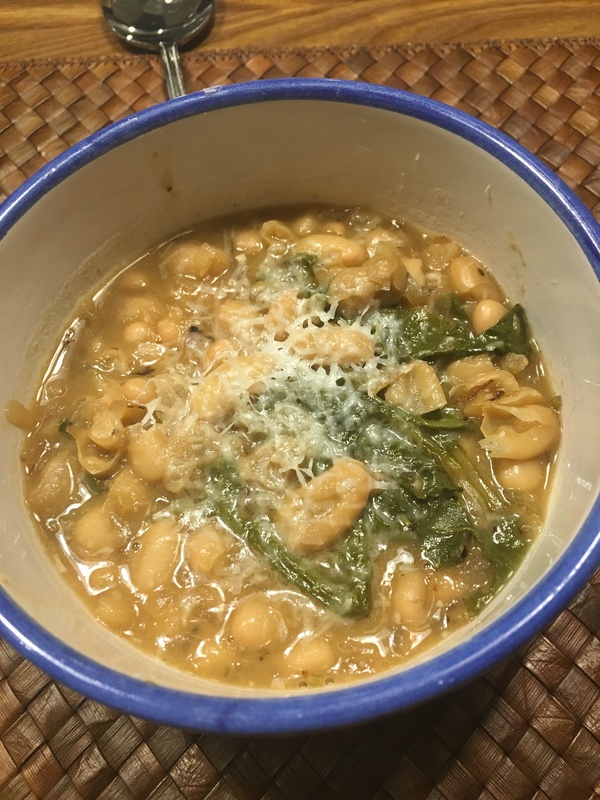 Sometimes I serve this soup with beautiful croutons if I can find them in specialty stores, but it is delicious and beautiful on its own, and very good for you! My family loves it , and I hope yours does too.